Sorry for not having a proper wrap to today’s 4-2 Dodger victory and to the homestand. A combination of working on a long-term project for the site and some family time intervened. Ted Lilly is sure having a weird season, isn’t he? Padres at Dodgers, 12:10 p.m. In non-Eugenio news, congrats to Matt Guerrier. He is taking a brief detour into paternity leave, and Josh Lindblom is coming back to the major-league club. According to ESPN Sports and Information, the last player before Andre Ethier on Tuesday to get the first two hits for a team in a single inning was Derek Jeter of the Yankees against Tampa Bay in the eighth inning, August 8, 2001. Two Jeter singles sandwiched five walks, a hit batter and two outs. Before that, believe it or not, it last happened in a Padres-Dodgers game, with Greg Vaughn doing it against Los Angeles in the sixth inning on September 12, 1998. And I guarantee you’re going to shake your head at the pitchers involved. With a 7-3 lead, Dave Mlicki gave up a leadoff single to Vaughn and forced him home with three walks. Sean Maloney (14 career games) relieved and hit one batter and walked the next to make it a one-run game. The next reliever was the storied Jeff Kubenka (12 career games), who gave up a game-tying sacrifice fly to Quilvio Veras and then got a second flyball out from Steve Finley. Kubenka then walked Mark Sweeney to load the bases again. The next batteer was Vaughn, who singled in the go-ahead run before Matt Luke (who had five RBI) threw out Chris Gomez at the plate to end the inning. San Diego won by that 8-7 score. That was a heck of a lot of walks. Matt Kemp had four by himself. And yet, after Andre Ethier’s grand slam gave the Dodgers an 8 2 0 linescore in the second inning, it was a surprisingly narrow 8-5 escape over the Padres on Tuesday. I didn’t see the second inning tonight, but I gather it was about as long as Marcel Proust’s “Remembrance of Things Past.” Don’t feel bad though, Tim Stauffer: I couldn’t get out of the second inning of that book, either. Update: I’ve made the following inquiry – How often in baseball history has a player had the first two hits in an inning, as Ethier did in the second inning tonight? The Dodgers’ 12 walks, by the way, were their most in a nine-inning game in more than 30 years, notes the team PR department. Padres at Dodgers, 7:10 p.m. The Dodgers begin play seven games behind the Giants. The race is on! Or it would have been, if Arizona weren’t making such a decisive worst-to-first run in the National League West. The Diamondbacks, 15 games behind the fourth-place Dodgers last year, have almost reversed that deficit completely with a 12-game lead this year. Charley Steiner and Rick Monday are about to join the Dodger announcer RSVP parade for 2012, writes Tony Jackson of ESPNLosAngeles.com. Jackson also reported Monday that the Dodgers would use a six-man rotation this week, with Dana Eveland a leading choice to start Thursday’s makeup game in Pittsburgh. That pitcher could then stay in the rotation after Nathan Eovaldi makes what is expected to be his final 2011 start (to preserve the 21-year-old’s arm). Roster space will not be an issue. 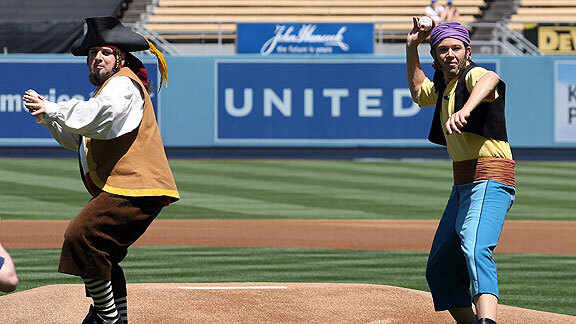 I don’t think I’m on board with his “empty prison camp” analogy to describe Dodger Stadium – let’s just say as prisons go, I could deal – but Eric Nusbaum certainly tells a woeful tale of his sadcap adventures at the ballpark on Pitchers & Poets. At Blue Heaven, Ernest Reyes writes about Silvio Garcia, a Cuban star of color that Branch Rickey considered bringing to the Dodgers in the Jackie Robinson era. Stephen Strasburg, the Washington Nationals prodigy recovering from surgery, is expected to make his first 2011 major-league start September 6 against the Dodgers, according to the team’s Twitter feed. James Loney’s white-hot walloping has upgraded his Dodger future all the way from non-existent to tenuous. By doubling and hitting his ninth homer of the season (and third in four games) tonight in support of Clayton Kerhaw and the Dodgers, who beat the Padres, 4-1, Loney extended his swashbuckling slugging streak to 18 for 35 with five doubles and four home runs in eight games: a .541 on-base percentage, 1.000 slugging percentage and 1.541 OPS. Loney pushed his OPS for the season above .700 for the first time since he doubled in four at-bats on Opening Day. Perhaps more significantly, since he began play on April 24 with his batting average at a season-low .165, Loney has basically been himself, producing an OPS virtually identical to his career .771. The news won’t light up Times Square, but it has helped Loney reach person-of-interest status. To be less opaque, it has reopened the once-dead discussion of whether the Dodgers would even consider keeping Loney in their 2012 plans. Because of baseball’s arbitration patterns that reward service time with cash even when the performance wouldn’t seem to justify it, Loney’s salary would almost be guaranteed to rise from the $4.875 million he is earning this year to the neighborhood of $7 million if the Dodgers don’t surrender their exclusive rights to him by non-tendering him for 2012. Loney got a 57 percent raise last offseason, from $3.1 million, after OPSing only .723 in 2010. Loney’s 2011 OPS right now is .705. The Dodgers could try to resign Loney after non-tendering him, but as was the case with Russell Martin last winter, that opens the door for any of 29 other teams to decide he’s worth more than the Dodgers think he is, not to mention for Loney to decide that a change of scenery would be good. Under different ownership, the Dodger might be looking right past Loney to MVP-caliber first basemen like Prince Fielder or Albert Pujols, but that’s not going to happen with this organization this winter. And frankly, a number of healthy owners will stay out of that bidding as well. Still, there remains a ton lined up against a Loney return, because Los Angeles might simply end up trying to address first base more economically. Loney’s surge has increased the chances that the Dodgers could stomach giving him a raise, but then again, it has also increased the potential size of that raise. Though the decision isn’t getting any easier, the news is that there could be a decision to make at all. If nothing else, it sure is a pleasure to see Loney look like a real hitter again. Clayton Kershaw pitches a complete-game six-hitter against the Padres (despite only five strikeouts against two walks)? Of course. Andre Ethier gets three hits in his first start after the whole “should he be playing” brou-non-ha-ha? Different sort of of course, but yes, of course. The Irony Committee would approve if Andre Ethier were traded in the offseason for an exciting Double-A prospect from Oakland. Christian Petersen/Getty Images Clayton Kershaw briefly becomes fortune’s fool by allowing a game-changing two-run home run to Cody Ransom of Arizona on August 7. Clayton Kershaw isn’t exactly having a “what might have been” season, but that didn’t stop me from wondering what else might have been. 1) April 16 vs. St. Louis: After giving up a single and a walk to Albert Pujols and Matt Holliday, Kershaw retired David Freese on a fly to left. But one out from escaping with a 2-1 deficit, Kershaw gave up a three-run homer to Allen Craig. With 111 pitches thrown, Kershaw was removed before the fifth inning was over for the only time this season. If it had been an out: one more out, three fewer runs off Kershaw. If it had been an out: one more out, one more victory, two fewer runs off Kershaw. 3) April 26 at Florida: One of two other times this season Kershaw didn’t complete at least six innings. With one out in a 2-2 tie in the bottom of the sixth, the Marlins loaded the bases on two singles and a walk. Mike Stanton lined a 2-2 pitch for a two-run single that provided the final margin of a 4-2 Florida victory. Kershaw actually stayed in to walk the next batter, before Mike MacDougal relieved and minimized the damage with a Greg Dobbs double play. If it had been an out: one fewer loss, one more out, two fewer runs off Kershaw. 4) May 18 vs. San Francisco: Kershaw had 26 1/3 consecutive scoreless innings against the Giants when he gave up a run in the third inning to break a scoreless tie. Then in the fourth, he was cuffed around, allowing four straight singles to start the inning for another run. “”I felt great, but maybe I was a little too predictable,” Kershaw told The Associated Press. “I threw just two pitches pretty much and maybe should have mixed in a little more stuff.” But the pitch that really had to eat at Kershaw, with the score only 2-0 and pitcher Matt Cain on deck, was the 3-2 fastball that missed against .208-hitting Mike Fontenot, forcing across the third of four runs Kershaw allowed. (Cody Ross later hit a sacrifice fly.) The Dodgers actually rallied to tie this game, 5-5, in the eighth inning, taking Kershaw off the hook, before Lance Cormier served up a three-run homer to Ross in the ninth. If it had been an out: two fewer runs off Kershaw. 5) June 4 at Cincinnati: This one just killed me. Kershaw was on fire, retiring 15 of the first 16 batters he faced, striking out nine. But in the sixth inning (see, this doesn’t just happen to Chad Billingsley), the Reds broke through with a single, a walk and a two-out RBI single by Brandon Phillips to tie the game, 1-1. The next batter, Joey Votto, torched an 82 mph slider for a three-run home run. Kershaw was saddled with two more runs in the next inning, but not for the first time, the Dodgers came to Kershaw’s rescue, with Kemp hitting two home runs in an 11-8, 11-inning victory. If it had been an out: three fewer runs off Kershaw. 6) June 9 at Colorado: The only sequence this season in which Kershaw went two consecutive games without a quality start was completed in Denver, when his opponent bit him once again in the sixth and seventh innings. Leading 4-0 going into the bottom of the sixth and having faced only two batters over the minimum, Kershaw let this one get away in a hurry. Troy Tulowitzki’s first-pitch, two-run double put the Rockies on the board in the sixth and prevented Kershaw, who retired the next two batters, from a chance at a clean escape. Relieved after loading the bases with none out in the seventh, Kershaw was charged with six runs in six-plus innings; the Dodgers lost, 9-7. If it had been an out: maybe more, but we’ll say two fewer runs off Kershaw. 7) June 26 vs. Angels: One strike from finishing the ninth inning in a 1-1, Kershaw gives up a go-ahead home run to Vernon Wells. But thanks to the murderers row of Juan Uribe, Dioner Navarro, Aaron Miles and Tony Gwynn Jr., the Dodgers push two across in the bottom of the ninth to win. If it had been an out: one fewer run off Kershaw. 8) July 2 at Angels: Kershaw falls behind 2-0 in the count, then throws a 95 mph fastball that Wells (what, again?) blasts for a two-run homer. And it could have been avoided if not for Dee Gordon’s ill-advised throw home on a one-out grounder with Jeff Mathis on third base. 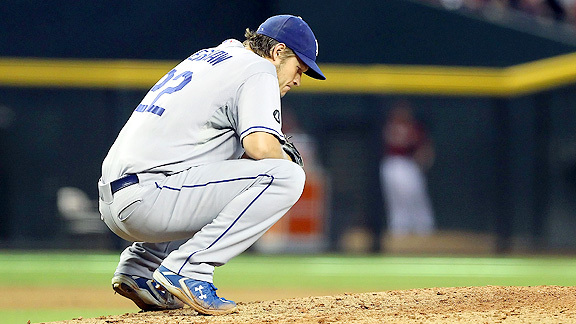 For the third time this season, Kershaw was charged with a season-worst six earned runs. 9) and 10) August 7 at Arizona: Kelly Johnson soon after packed his bags for Toronto. Cody Ransom had just arrived from the minors. But when their paths crossed Kershaw on this Sunday, with the Dodgers going for a three-game sweep that could have actually put them within eight games of first place in the National League West with about eight weeks to go, each hit a two-run home run — just enough for the Diamondbacks to put the Dodgers back in their place, 4-3. So, what would all this have meant, if we could have our way and we didn’t believe in the Butterfly Effect? Instead of being 16-5 with a 2.51 ERA, Kershaw would have saved 20 earned runs with those 10 pitches and would be heading into tonight’s game 18-3 with a 1.55 ERA. … For now, though, Jarrin said he wants to continue to call every game, although he did take an in-season vacation for the first time this year and said he likely will do so again next year. Jarrin said that after more than a half-century of calling Dodgers games on Spanish-language radio, he still has a passion for the job. This time last year, John Lindsey was the Dodgers’ feel-good story. Christopher Jackson of Albuquerque Baseball Examiner catches up with him. … As it stands, Ethier won’t be eligible for free agency until after 2012. But is he trying to force his way out of town a year early? That’s my theory. I don’t have enough insight to know for a fact that it’s true, or that it isn’t. That’s why they call it a theory. But I have to say, when you take the statements Ethier made in March, and to Simers this weekend, and put them together, it sure smells that way. Could it be that Ethier is trying to become such a distraction that the Dodgers, rather than going through the expensive process of arbitration this winter — he already is making $9.25 million this season and would get a significant raise — will simply non-tender him, making him a free agent a year early? One thing is clear: if it’s a distraction Ethier is trying to become, he is at least succeeding there. Mattingly made that fairly obvious before Sunday’s game, when he said he was “blindsided” by Ethier’s remarks. He made it clear again during the game when, with the bases loaded, nobody out, the pitcher’s spot due up and the Dodgers trailing 7-2 in the bottom of the seventh inning, he sent Eugenio Velez — that would be the 0-for-28 Eugenio Velez — to pinch hit and kept Ethier on the bench. Although Ethier was on deck to hit for Rod Barajas when the game ended, Mattingly made it clear again immediately after the game, when asked by a reporter whether Ethier will be back in the lineup Monday night against the San Diego Padres. It was a cryptic comment from an exasperated manager, but it hinted that Ethier’s playing time could be sporadic the rest of the way, especially with the Dodgers (62-70), who are in fourth place in the National League West and 12 games behind the division-leading Arizona Diamondbacks, far out of contention. If Ethier is trying to outsmart the system, well, the one he is outsmarting might be himself. Let’s say he does force the Dodgers’ hand, and they do cut him loose, and he does become a free agent. In that case, how much of a market will there be for a guy who is coming off a down year? A guy who probably is going to be coming off arthroscopic knee surgery? A guy who so often lets his emotions get the better of his game? A guy who certainly isn’t helping his reputation with all these public outbursts, especially at a time when, according to various sources, scouts from other teams are starting to pick up on his moodiness and the fact he can be high maintenance? Before today’s game ended, Andre Ethier, focal point of a day-long controversy, made an appearance in the on-deck circle. Tony Jackson of ESPNLosAngeles.com has a lengthy account that you need to read in full. If the goal, weeks and weeks ago, had been to get Ethier to as close to 100 percent health as possible before putting him back on the field, there wouldn’t be this confusion, and everyone would be healthier and happier. It would be clear: Ethier would have the necessary treatment on his knee, including surgery, before returning to the field. For all the virtues of what a partially healthy Ethier provides, it’s hard for me to see how it doesn’t serve both Ethier’s and the Dodgers’ short-term and long-term needs to have made this the goal. The Dodgers have gone through this dance before with other players, most notably this year – though with much less bitterness – with Jonathan Broxton. It’s a weird game of chicken where each party puts the burden on the other to determine when to sit an injured player, and all it does is kick the can down the road until the problem is worse. And the team isn’t much better in the interim. Mythology aside, injured players, however gutty, generally aren’t as good as healthy backups. Ethier certainly hasn’t been. And whether the Dodgers were fighting for first place or fighting to stay out of last, a hobbled Ethier is not such a valuable asset. We’re not talking about a hangnail here. We’re talking about an essential limb, and this is not a Monty Python movie: If you don’t have your arms and legs, you’re usually not going to be a very good baseball player. This is a sport of mechanics, of timing, and the smallest injury can knock you off your game, even if you feel like you can and should play. If the injured baseball player doesn’t feel he can take himself out of action, because of love of the game, or arrogance, or denial, or fear of being labeled a sissy, then management needs to make the decision for him. You can’t rely on the Russell Martins and Broxtons and Ethiers to break “The Code” of manning up. There are a few exceptions to the rule (his name, I believe, is Kobe Bryant), but you need to have the rule. Everyone’s wondering, “Is it really that bad?” If you have to ask, then the answer is yes. Even Kirk Gibson sat out 44 of 45 innings in the 1988 World Series. Mark J. Terrill/AP Carlos Gonzalez was 8 for 13 at the plate this weekend and also killed the Dodgers with his glove. Today, according to the ledger, was my 581st game at Dodger Stadium in the past 20 years. I would guess that in no more than five of those games have I sat on the left side of home plate. But today, I was in Aisle 119 of the Loge Level, eight rows from the front, just to the left of the screen behind home plate. It just so happened that from that vantage point, I had the best possible view of what I believe is one of the best catches I have ever seen at Dodger Stadium: Carlos Gonzalez’s all-out, mid-air, backhand grab of a Justin Sellers drive near the right-field line with two out and two runners on base in the bottom of the fourth inning. That catch represented the difference between another Dodger comeback victory over the Rockies and what turned out to be Los Angeles’ 7-6 defeat. Instead, by the time his 41-pitch first inning was over, five runs were adhered to Eovaldi’s name. He pitched admirably enough afterward, before hitting the showers with a four-inning, 89-pitch stint, but “what might have been” was written all over those first four frames. Nevertheless, the Dodgers almost pulled this one out, chipping away with single runs in the first and third and then two pair in the sixth in the seventh. There were no baserunners in the eighth or ninth, however, as the Rockies bullpen prevented a repeat of its Friday and Saturday downfalls. Lineup not available at go time. I’m withholding comment on the Andre Ethier column in the Times today by T.J. Simers until I get more information. Things be murky. On August 1, Kemp was .024 behind in batting average, two behind in home runs and one ahead in RBI. Unless someone served him breakfast in bed or left flowers on his doorstep, it’s safe to say that Chad Billingsley’s day got off to a gruesome start. It was as if he were Charlie Brown raking the same pile of leaves, and then Snoopy was jumping in and exploding them all over the yard, and Charlie Brown would get back to raking. Billingsley allowed three baserunners in the first inning; none scored. He allowed runners to reach second and third with none out in the second inning; none scored. Then in the third, Mark Ellis doubled, Carlos Gonzalez (4 for 6) singled and Troy Tulowitzki homered, and it was Billingsley who was getting raked. Billingsley was on the verge of leaving the game as early as the fourth inning, when he was already approaching 100 pitches and falling even further behind, 4-0, on an unearned run driven home by Gonzalez. Somehow, on the hottest day of the year at Dodger Stadium, Billingsley managed to understay his lack of welcome all the way to the sixth. After walking pitcher Kevin Millwood with one out, Billingsley benefited from an 8-4 sun-aided forceout at second base and then struck out Ellis on season-high pitch No. 123. The ledger left by Billingsley when pinch-hitter Trent Oeltjen popped up for him showed six innings, four runs (three earned) 10 hits, two walks and five strikeouts. And yet, Billingsley almost was the winning pitcher. That’s because for the fourth game in a row, the Dodgers unfurled a surprising big-and-tall inning. Aaron Miles and James Loney singled. Matt Kemp was safe at first when third baseman Kevin Kouzmanoff threw errantly home, Miles scoring the Dodgers’ first run. Kemp was credited with his 99th RBI of the season, somewhat inexplicably but perhaps on the theory that Kouzmanoff should have thrown to first base. Then, the error was switched to catcher Chris Ianetta, but still Kemp’s 99th RBI remained in the boxscore. Rivera drove in the second run, with Kemp nearly making a costly baserunning mistake, only to be safe at third when Kouzmanoff muffed Gonzalez’s throw for another error. Casey Blake then ripped a double to the wall in left-center. Kemp and Rivera scored to tie the game, but Ethier, waved home by Wallach a day after running through a Wallach stop sign, ended up with the same result – out by a rod. Still, the Dodgers took the lead when (after A.J. Ellis was hit by a pitch) and Jamey Carroll singled home Blake. The Dodgers led, 5-4. But Hong-Chih Kuo, who had warmed up when the Dodgers were trailing by four, entered the game in the seventh and on his first two pitches allowed a bunt single to Gonzalez and Tulowtizki’s second home run, which took high-speed rail over the short fence in left for a 6-5 Rockies lead. The Dodgers threatened a second rally in the bottom of the eighth when they put two on with one out, but Carroll flied out and pinch-hitter Tony Gwynn Jr. popped out on a 3-2 pitch from Rafael Betancourt. The out gave Betancourt 18 consecutive scoreless innings in which he had struck out 30 and walked one. But after Miles popped out to start the bottom of the ninth, Loney lowered the boom on Colorado once again, hitting a no-doubter into the right-field bleachers for his second homer in 24 hours against Colorado and sixth against the Rockies this season. Soon after Kemp just missed winning the game with a high fly ball to left, we were headed into extra innings. Thirty-one home runs. One hundred runs batted in. Dodgers 7, Rockies 6. Courtesy Los Angeles Dodgers Matt Kemp after Friday’s game.